Happy DIY Monday! I came across this post in one of my favorite blogs: Oh Happy Day. It’s a really fun “bride” and “groom” wire glittered chair sign. 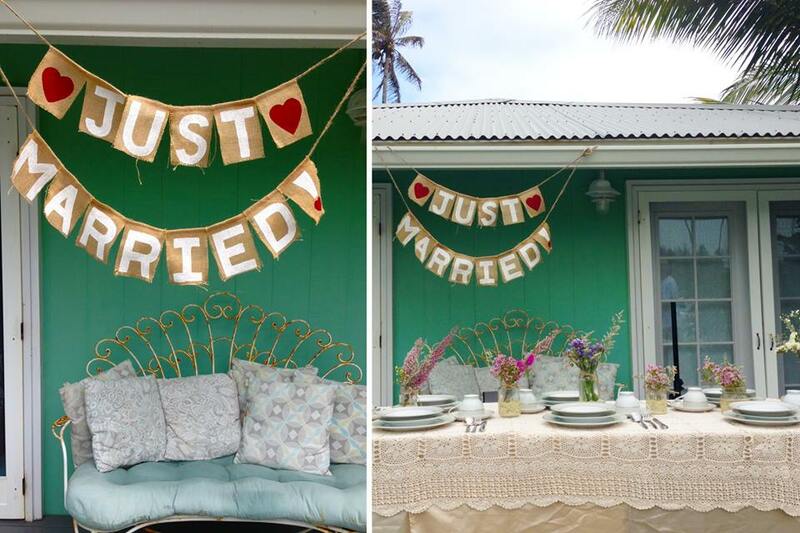 Honestly, I can think of a bunch of other ways this could be cute too… imagine you spelling out a special quote or your names and wedding date and hanging it above the dessert table, or making smaller versions for special guests. The options are endless. Best part, its super easy to do. Step 6: Using your spray mount, spray a portion of the wire and then quickly cover it with some glitter. Make sure you’re working on a piece of paper that you don’t mind chucking afterward. Step 7: Continue spraying and pouring on glitter until it’s covered. Let it sit while it dries. Step 8: As soon as it’s dry, shake off the extra glitter and return back into the bottle. 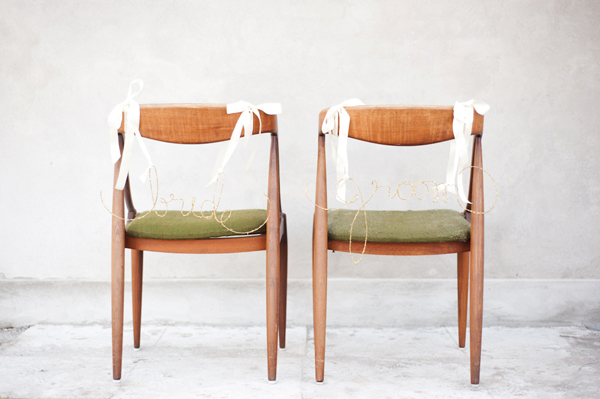 Step 9: Tie a ribbon to two letters and tie to a chair. Easy right? And sooo cute! I bet these would look awesome in wedding photos as too! Hope you enjoyed our Monday DIY tip ! 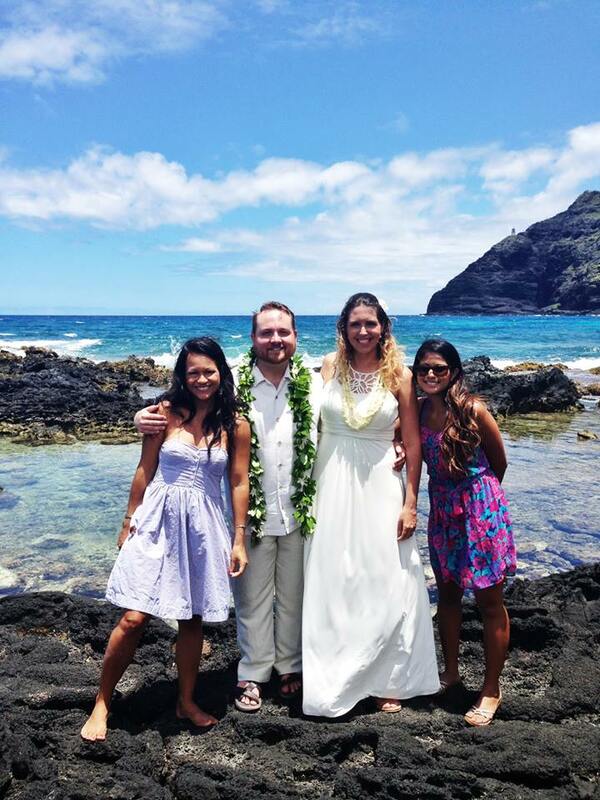 xoxo, Hawaii Wedding Planner, Best Day Ever! 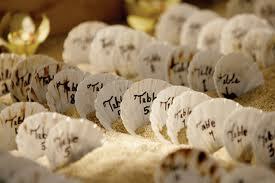 Table number ideas from Pacific Weddings. 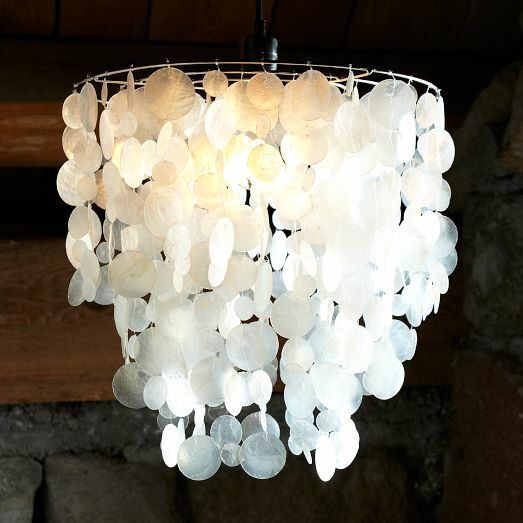 Hanging Capiz Shell Chandelier from one of my favorite furniture/design stores ever… West Elm. Debbie Hemingway, local florist and designer actually has these capiz shell chandeliers for rent too! How cool! 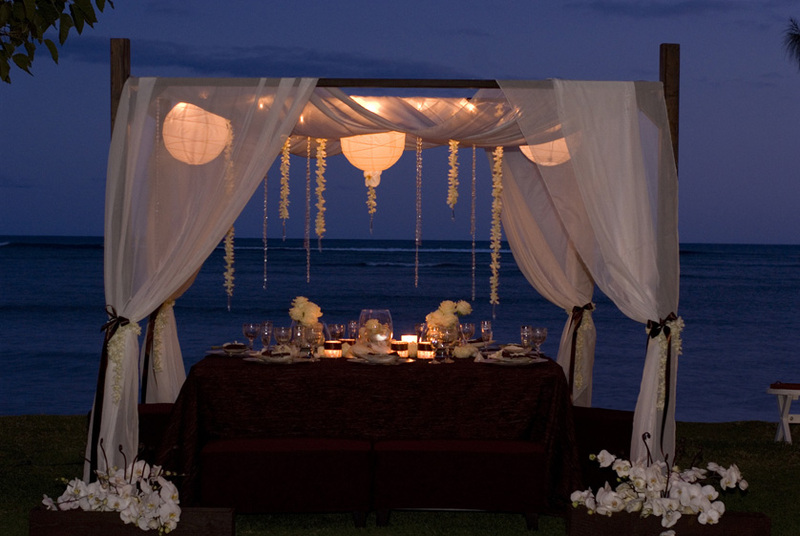 Beach canopy honeymoon table design by Designs by Hemingway. 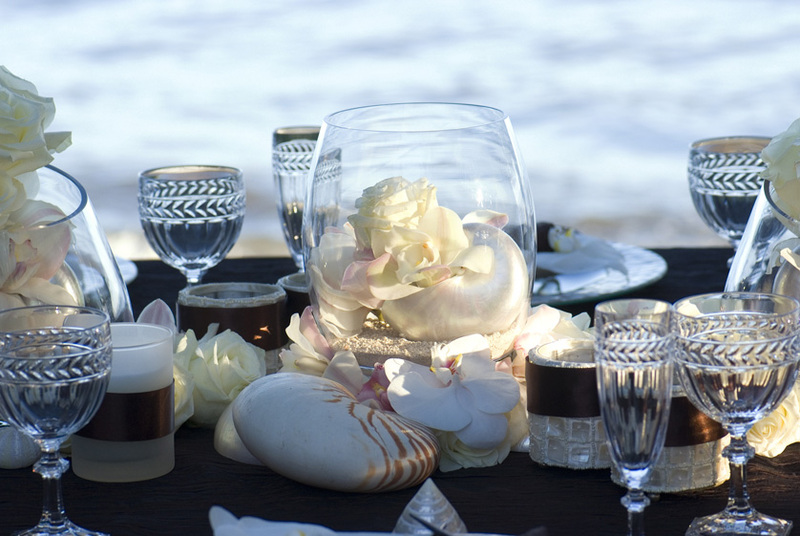 Wouldn’t you love to have a private dining table on the beach like this? 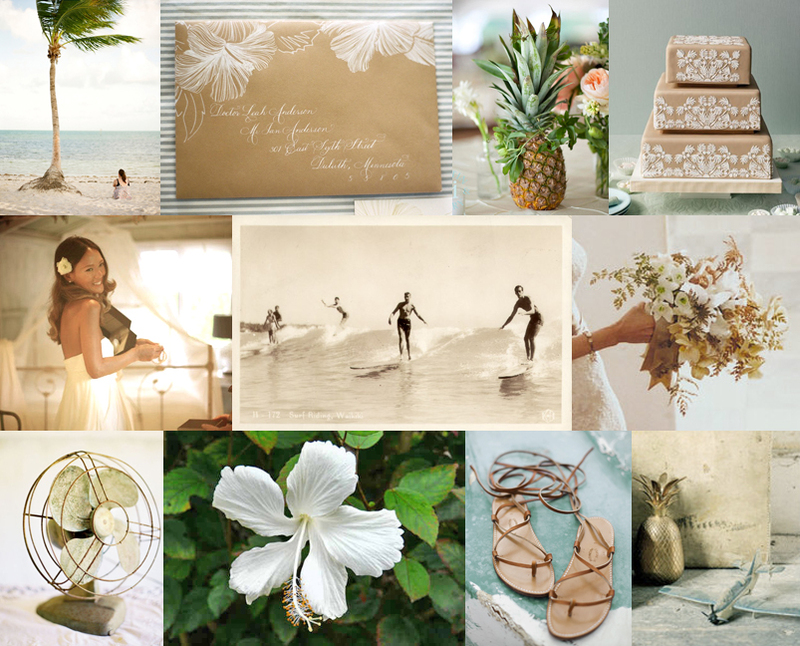 Beachy details by Designs by Hemingway. Loving this! 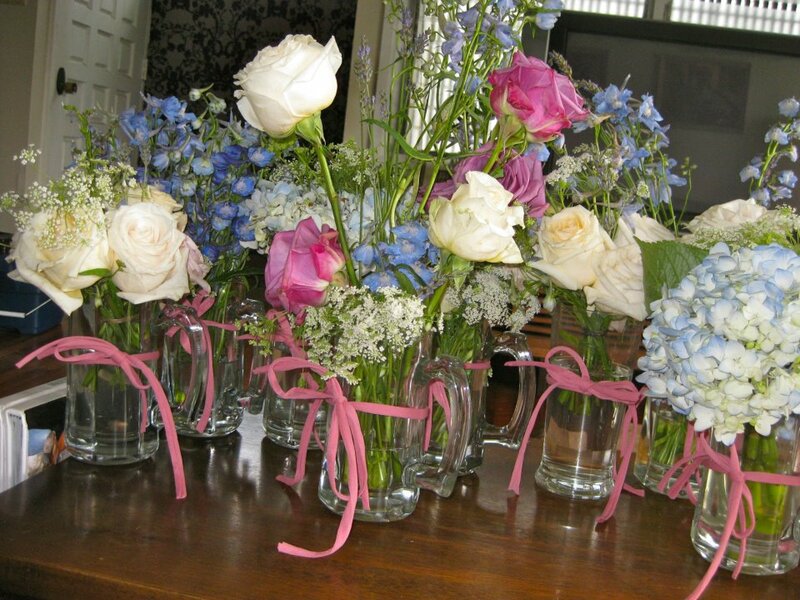 Vintage glass bottles make the perfect floral holders. The best part – You don’t need many stems to make a statement. These beautiful glasses almost scream for simplicity. 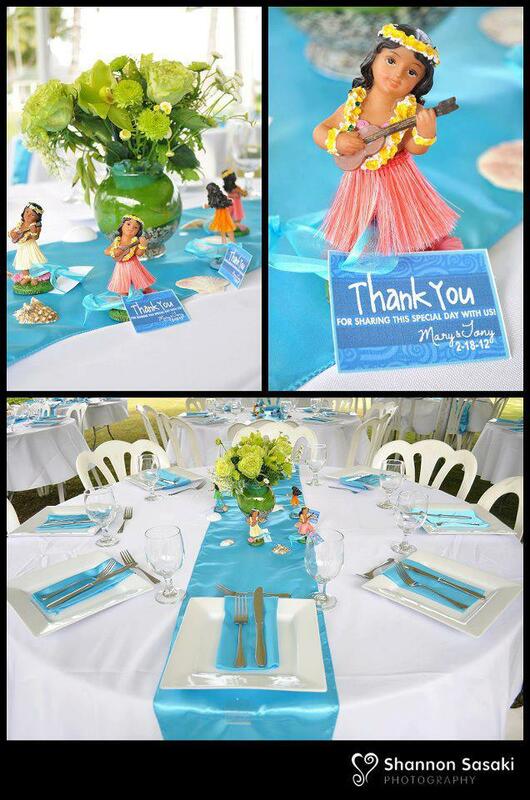 For more Hawaii beach inspired wedding ideas contact Best Day Ever, Hawaii’s favorite wedding planner & event designer today! 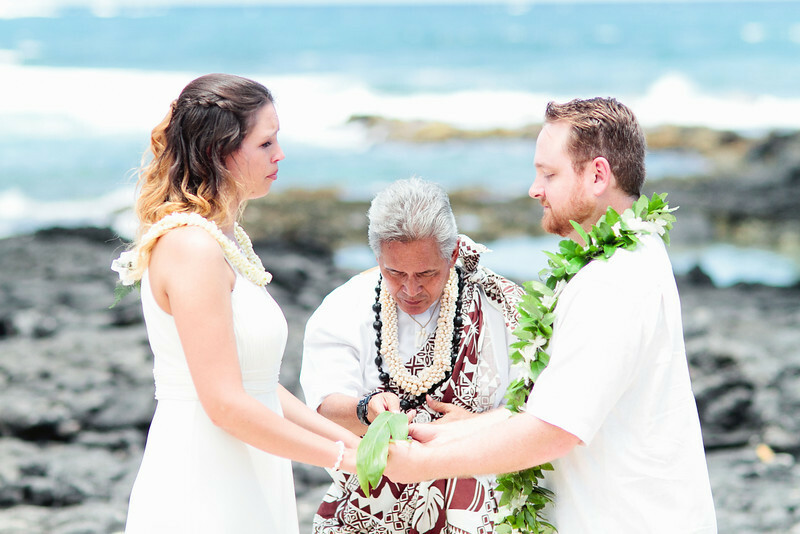 What is a lei exchange ceremony and should we have one? What kinds of leis do you usually use? 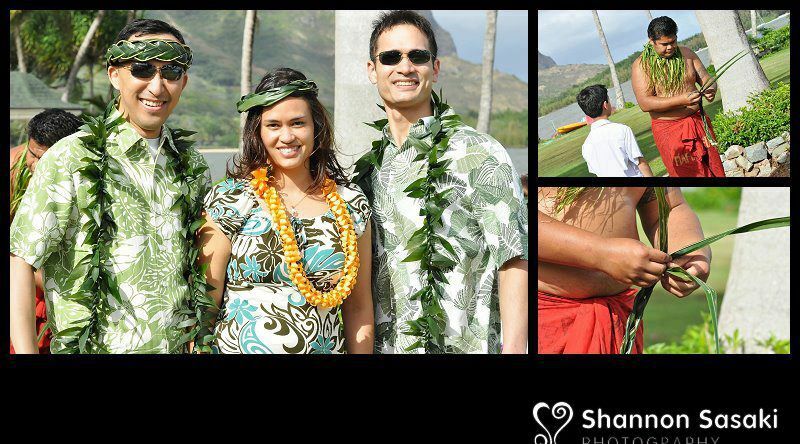 Traditionally the grooms are presented with a Maile lei. 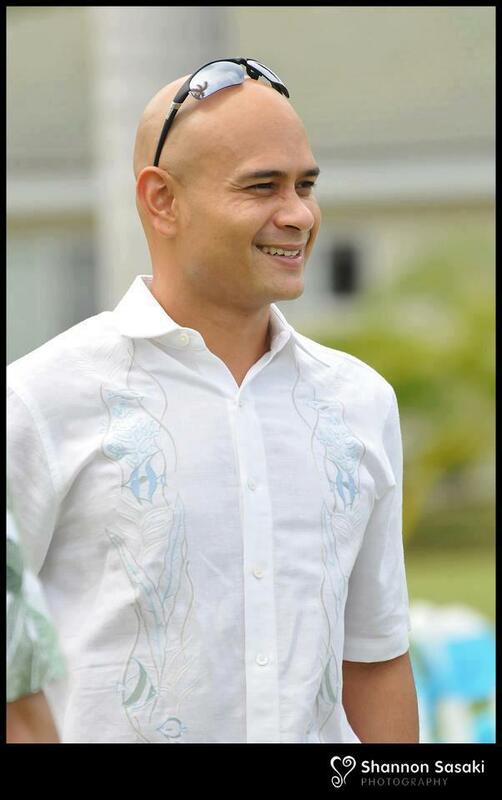 Maile is a Hawaiian leaf which is woven into a lei that hangs around the grooms shoulders and down the front of his suit. 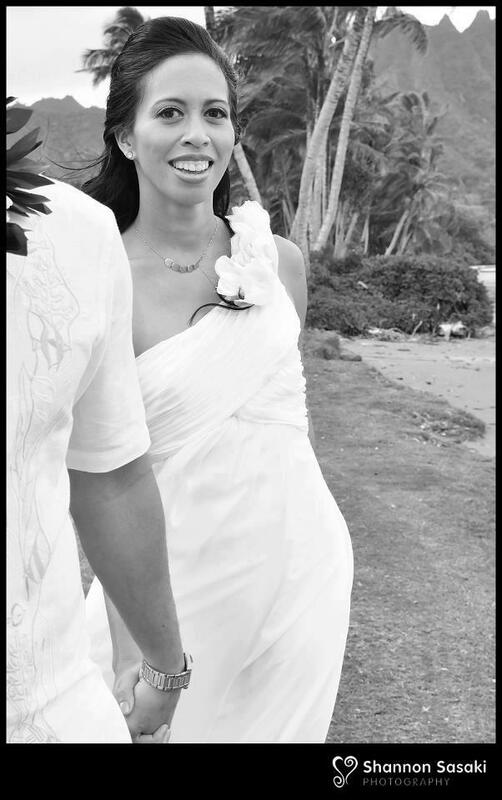 Maile leis are often intertwined with fresh pikake or tuberose florals and can range anywhere from $30 – $150. 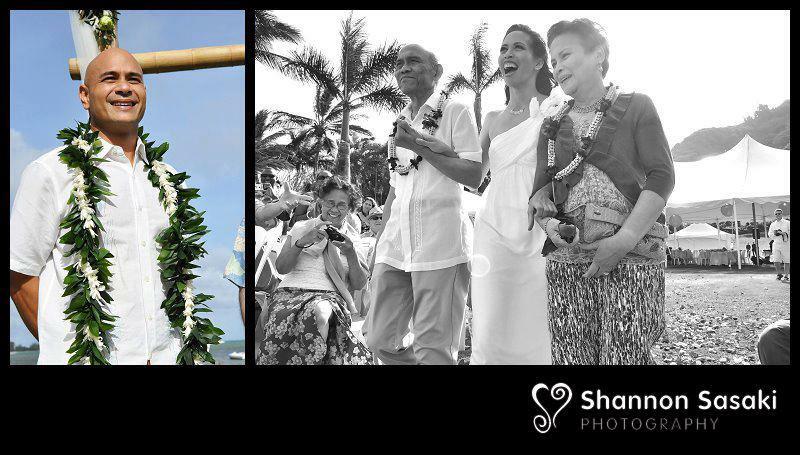 Brides are usually presented with a fresh floral lei. We would suggest you stick with something white since many colored florals (orchids, etc.) may have some dye in them… AND that will stain your dress. A beautiful choice is the Pikake lei. The pikake is a tiny white Hawaiian flower that is what I would say – the sweetest smelling flower on the island. 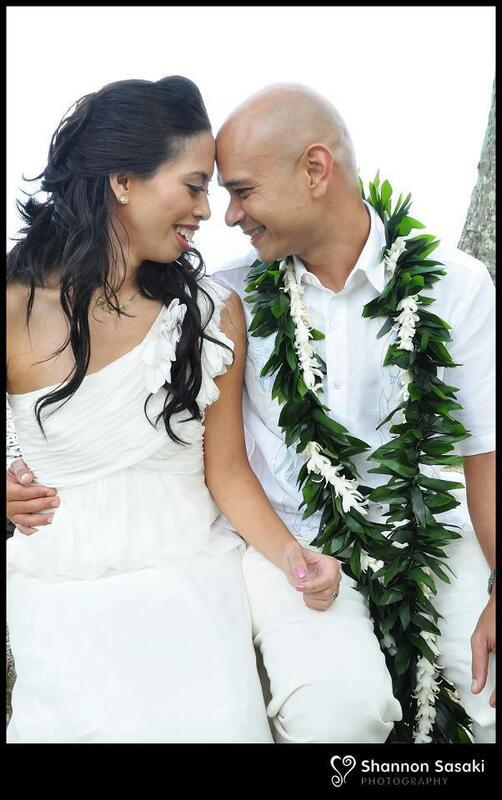 Most times pikake leis are sold by the strand and a bridal lei usually consists of 3 or so strands woven together. Pikake leis can cost anywhere from $20- $70. 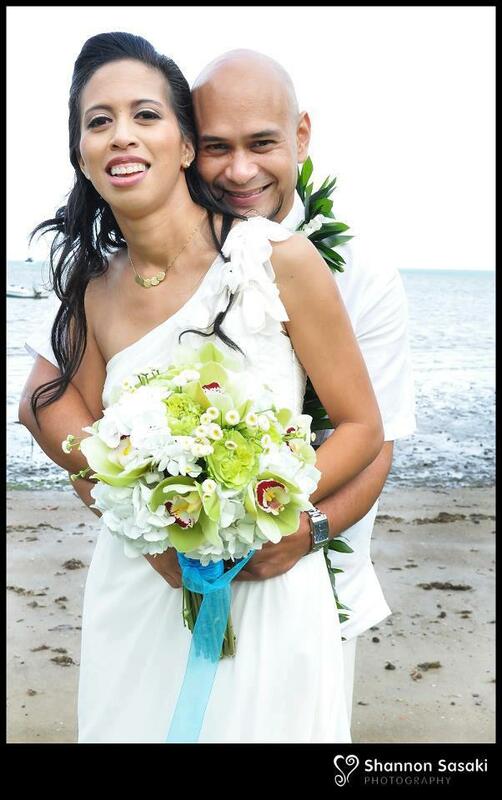 Most Hawaii florists carry Maile and Pikake leis and they can easily add them to your order and deliver them on your special day. 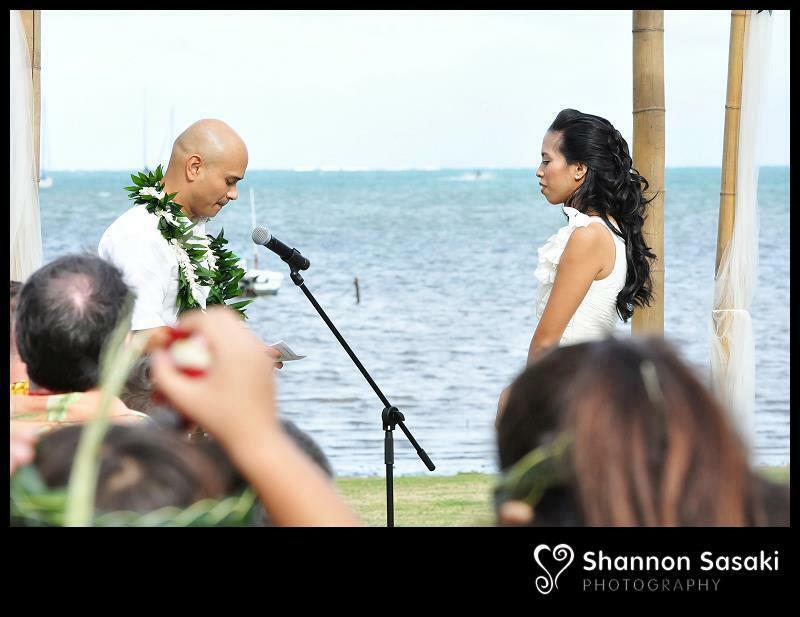 Want to see some sample Lei Exchange sayings – Click here for a few samples you can give your officiant, priest or pastor. This weekend I had the pleasure of “meeting” the awesome couple that is Emily & Bill. Even though we just “met” over the phone, I instantly felt their ease and connection with each other. Throughout the conversation, they took turns speaking, no one overpowering the other, constant laughter. It’s one of the great perks of what we do, meeting great couples truly in love. So, how did the couple meet? It was over three years ago, Bill spotted Emily’s profile on OkCupid. Emily had posted, “Nickelback is the 2nd worst band ever, who is the first?” Bill responded correctly with Creed, and from there they hit it off. Fast forward from their first date on April Fools of ’09 to March 01, 2011. Bill was chosen to be a participant on ABC’s Wipeout, I’m sure many of you know of this hilarious game show. The taping of the show carried on over a span of a week. Bill made it to the final round, and on the last day of taping, Bill popped the question to Emily on NATIONAL TV, in front of millions of viewers. Emily remembers the day as lies upon lies, not just from Bill, the whole Wipeout production crew was in on it. Bill had told Emily that Wipeout was incorporating “family interviews” on the show and that Emily was going to be “interviewed” so she “should wear something nice” and “maybe even paint her nails“. After being locked up in a trailer for hours, production was finally ready for her, and well….see it for yourself…. Bill may not have won the $50,000 cash, but he won the best prize of all, love with Emily that’ll last a lifetime. Congrats you two lovebirds!! 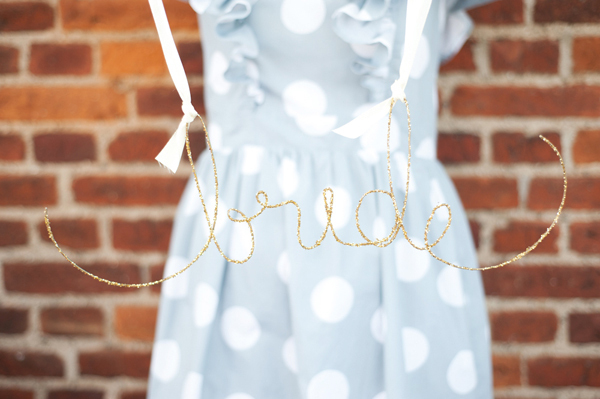 FREE Personalized Wedding Hanger! Just “Like” this post or comment on it! 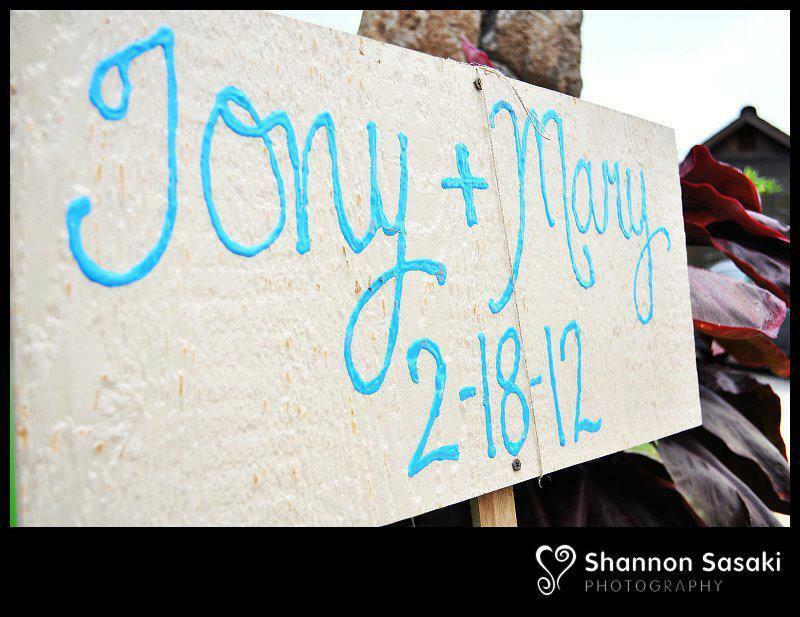 We just got our Best Day Ever personalized wedding hanger in the mail… and are just ♥LOVING ♥ it! Don’t you want one too? All you have to do is “Like” this post or comment on it and you are entered to win a Personalized Wedding Hanger of your own! Super easy right? They make really cute gifts too! Winner to be chosen on May 1st. 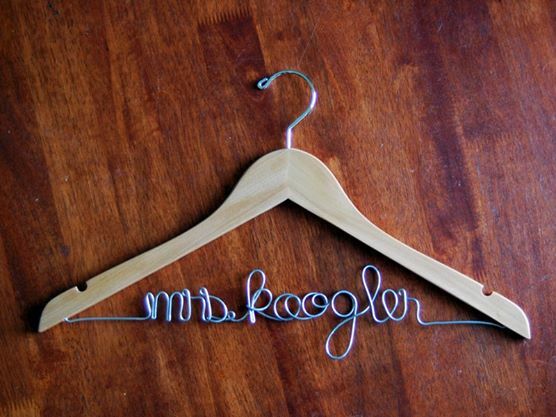 Loving our personalized hanger! You need one too!! I can’t help it, she’s always doing something so cute – I had to include her in the pic..
Special Thanks to Travis at The Wedding Hanger Shop for the hanger donation! Free shipping too!! Don’t miss your chance! Our’s came out soooo cute! 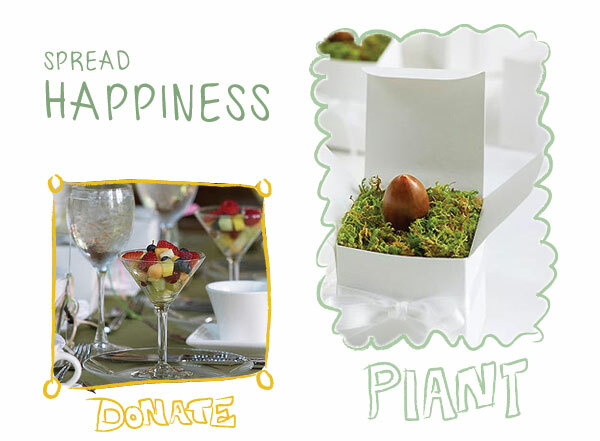 Tip1: Eco-Friendly Favors! Check out these Nature Bird Seed favors from Etsy. 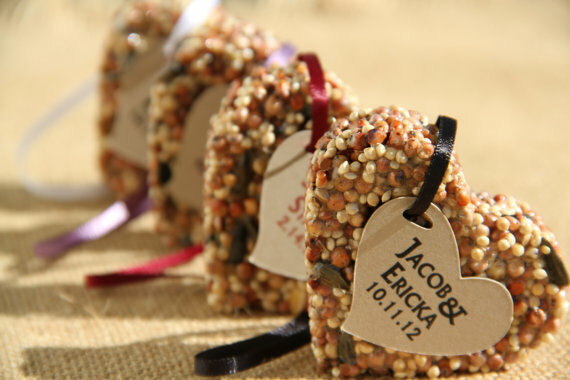 Super cute hearts made of birdseed and biodegradable material make the perfect wedding favors. Tip2: Plant a Tree! Encourage guests to start an herb garden or plant a tree by giving each guest a mini herb plant as a special wedding gift. Growing your own plants and herbs at home saves money, gas, and tons of waste! 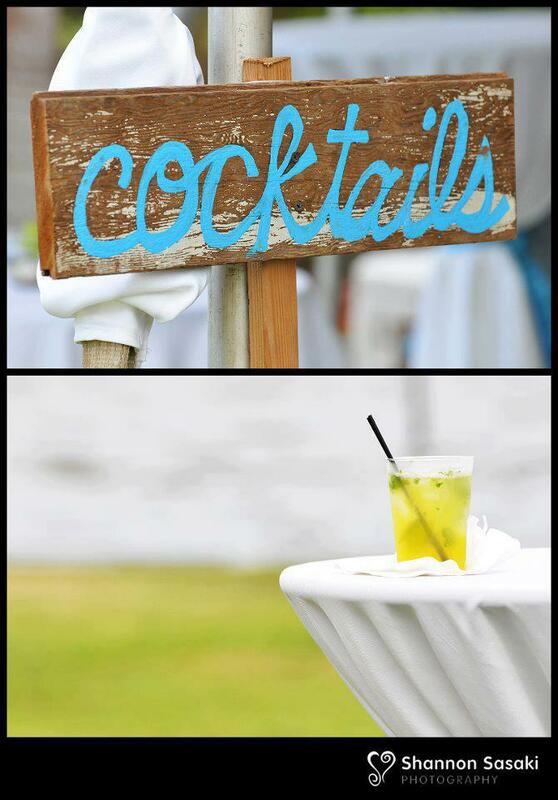 Tip3: Choose an Eco-Friendly Venue. Check out venues that are earth-friendly. One that comes to mind here on Oahu is the Loulu Palm who has recycling bins they encourage you to use onsite. Ask each venue if they are eco-friendly and what efforts they are making to be so. Tip4: Buy a Second-Hand Dress. 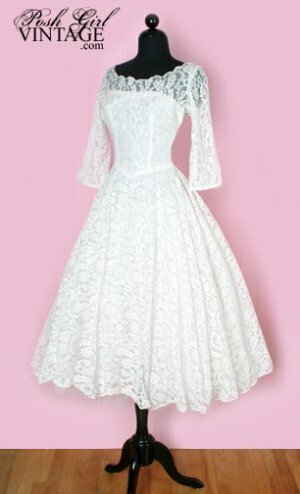 Have you seen some of the gorgeous vintage gowns at www.vintageous.com? If not you have to check them out! 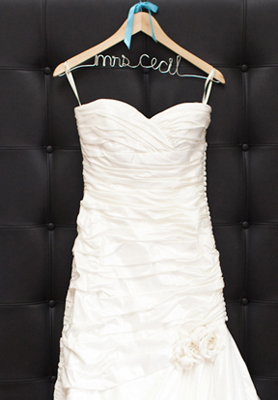 Posh Girl Vintage also has some great pre-owned dresses, like the one shown below. Tip5: Use Real Dishes. 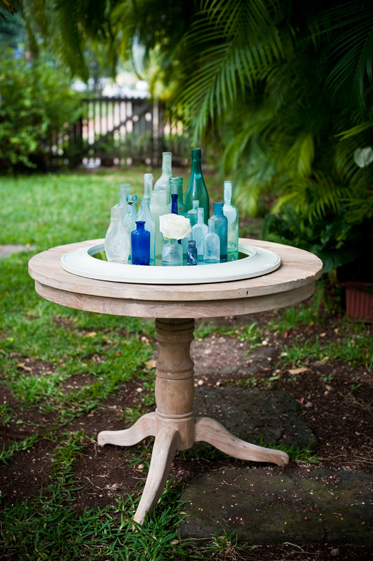 Using real chinaware, silverware, cloth napkins, glasses and tablecloths (that can be washed and re-used) will save tons of trash and will look so much more elegant! 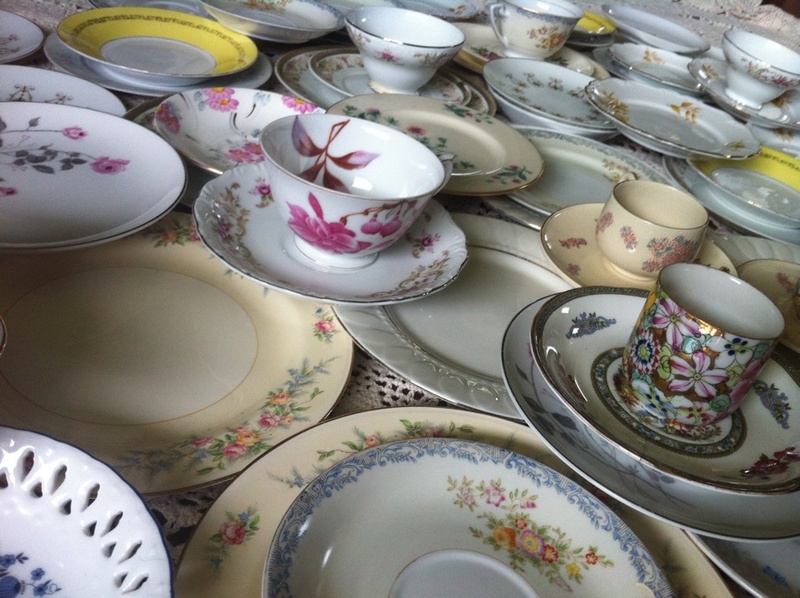 Check out our website for vintage chinaware rentals! 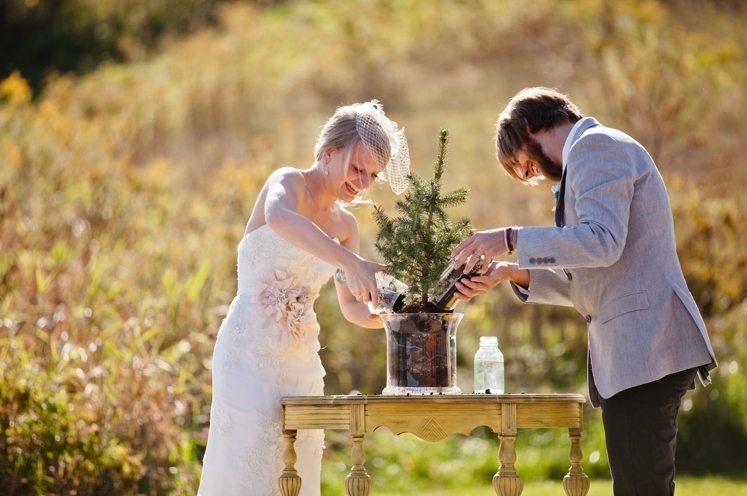 Tip6: Eco-Friendly Wedding Sites. 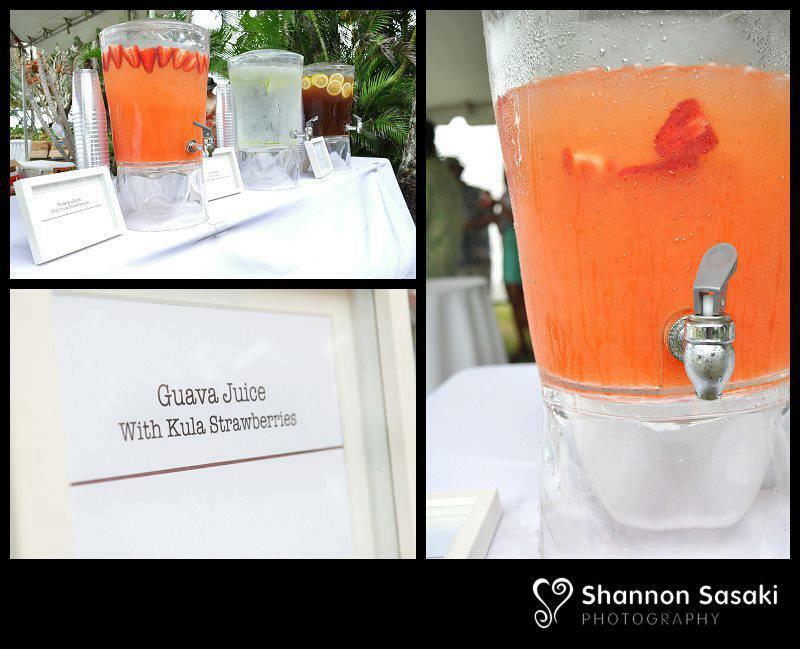 Check out: Intimate Weddings, Eco-Beautiful Weddings, and Eco and Elsie for great earth-friendly wedding tips and tricks! 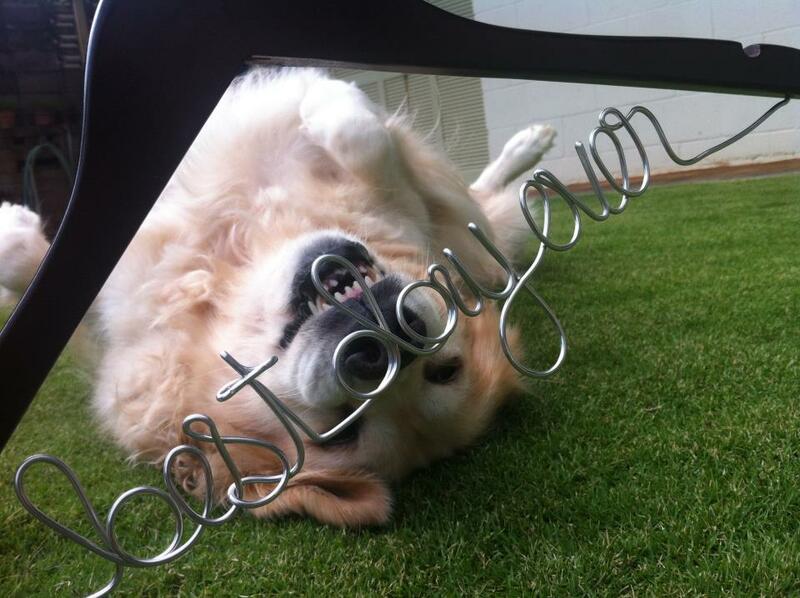 Here are some great tips posted from Eco and Elsie. Tip7: Donate centerpiece florals. 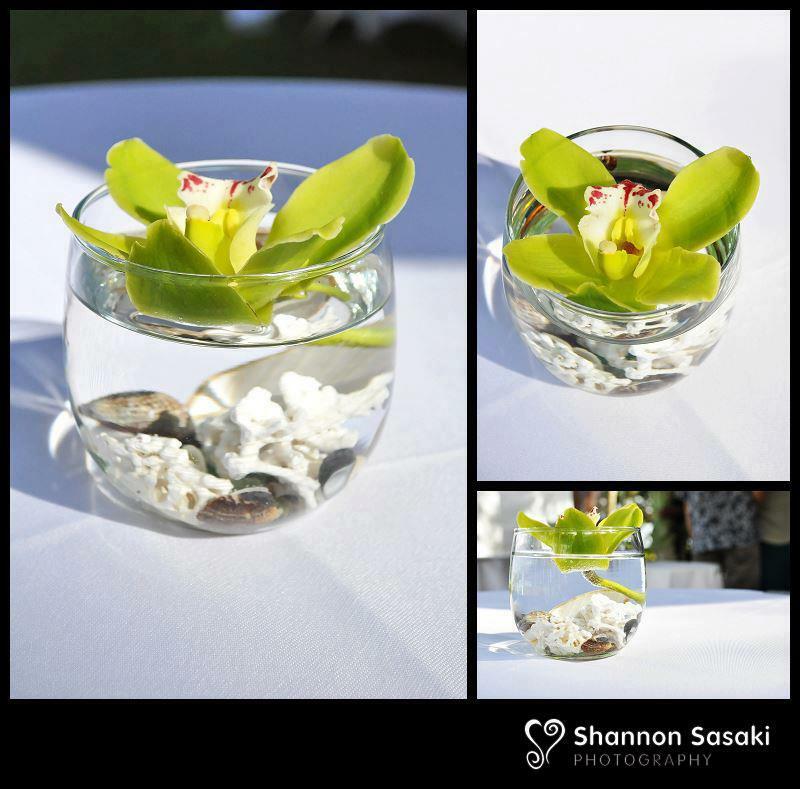 Rather than letting those gorgeous centerpieces go to waste, why not donate them to a Children’s Hospital or Senior Care Home? 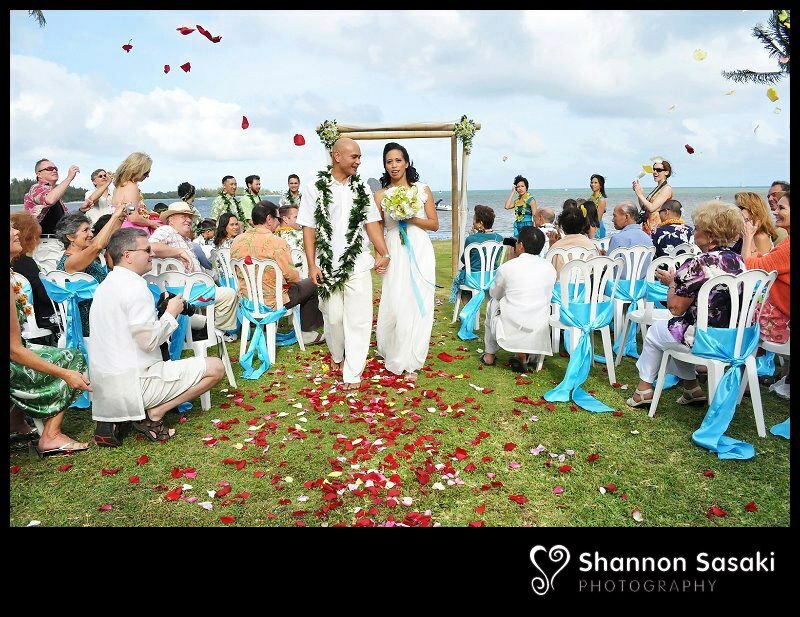 Best Day Ever has just introduced their “Share the Aloha” program in which we will handle the floral pick-up and drop off and all the details and coordination. It’s your choice, you can donate one arrangement or 30 arrangements. We have set up a program with the children’s cancer floor at Kapiolani Medical Center and the four Senior Care Homes in Manoa in which we contact them ahead of time and schedule visitations. We even create cards from you “Mr. 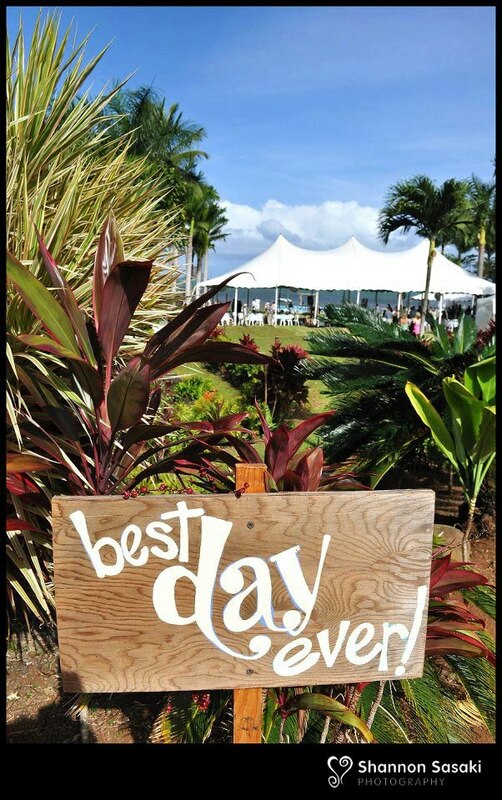 & Mrs. Jones” and Best Day Ever, printed on recycled paper -to go with each arrangement. The florals are hand-delivered by Erika and I and used to make someone else smile for the next few weeks. 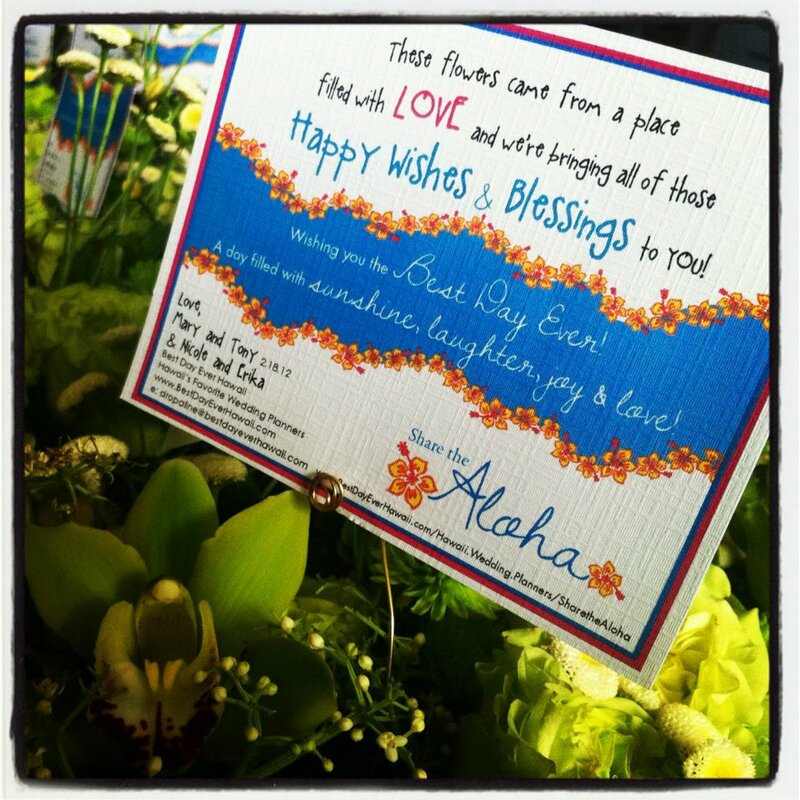 For more details on hawaii floral donations and Share the Aloha: click here. Hope you enjoyed our Top 7 Eco-Friendly tips! We’ll be posting a lot more on earth-friendly favors, venues and vendors in the upcoming months as we just booked our first Eco-Friendly bride Georgia – who we are thrilled to be helping with a full coordination. Wishing everyone a very Happy EARTH DAY!! Attention all brides and grooms to be (and friends of brides and grooms to be) … our friend Travis at The Wedding Hanger Shop is joining with Best Day Ever to offer one special bride (or groom) a FREE Personalized Wedding Hanger! That’s right – we said “FREE!”. All you have to do is leave us a comment at the end of this post with your e-mail and contact name, OR send us an e-mail at dropaline@bestdayeverhawaii.com and you will be entered to win! In 2 weeks, on June 1st, we will pull one lucky winner and you will get to choose what type of hanger you would like and what you would like it to say. 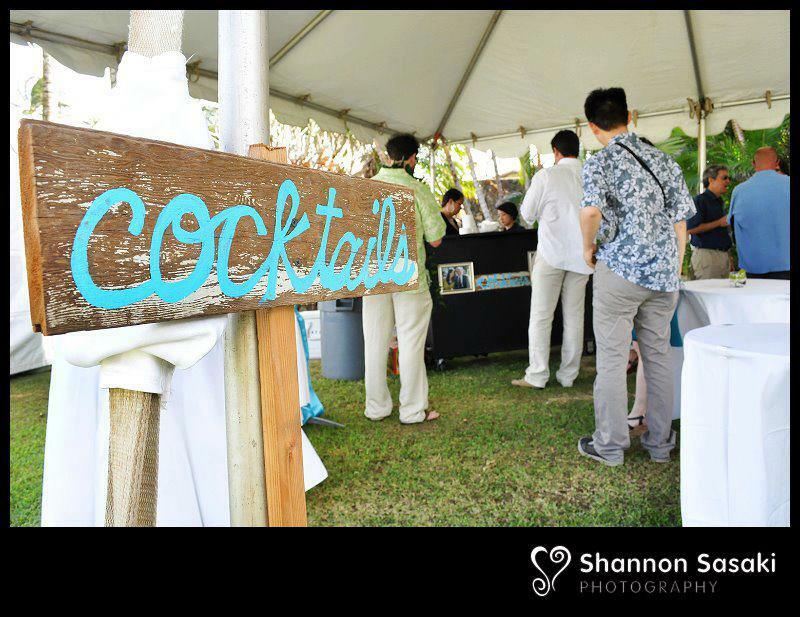 As an added bonus everyone who signs up will also get on our newsletter and receive tons of Hawaii-specific wedding tips & tricks, exclusive monthly wedding deals from other wedding vendors on the islands, and much more! 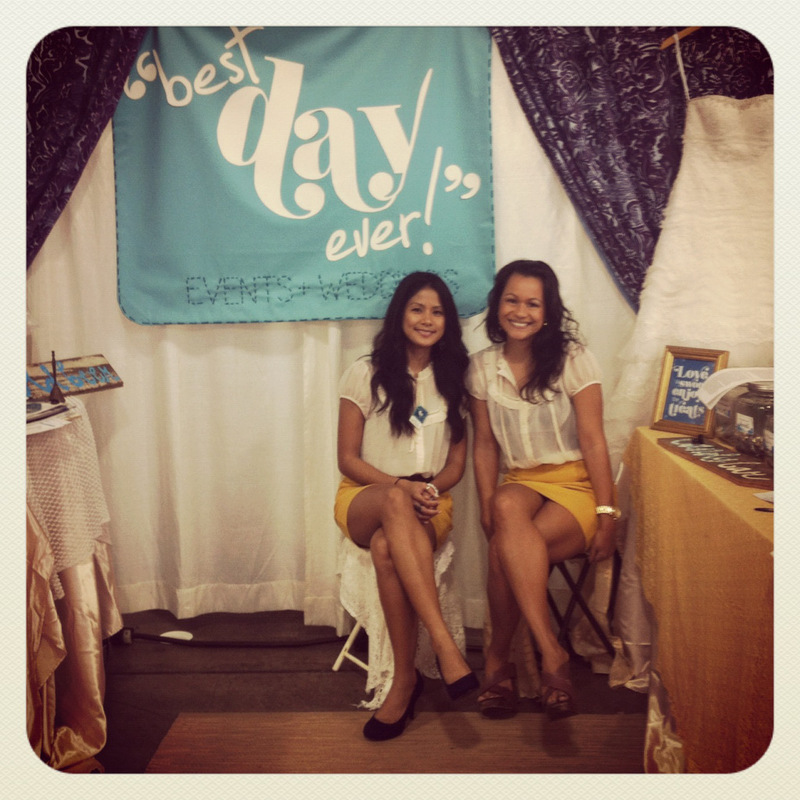 HOW: Comment HERE on this blog post., comment on Best Day Ever’s Facebook wall OR just E-mail us at dropaline@bestdayeverhawaii.com, we will need your name and e-mail address to enter you in the contest. 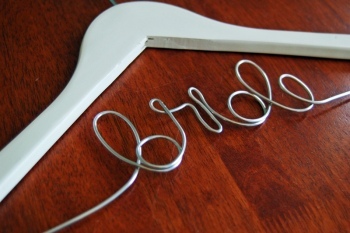 WHEN: On June 1st we will choose a winner at random and Travis from the Wedding Hanger Shop will design you a one of a kind personalized hanger for you and ship it to you asap – for FREE! 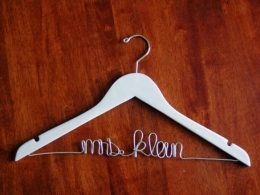 You’ve probably seen our posts about these one of a kind wedding hangers that have your new name “Mrs. 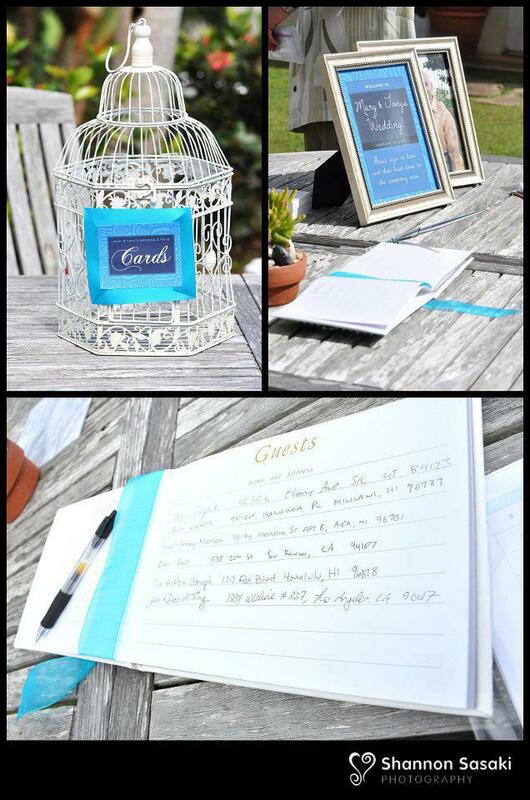 Jones” written across the bottom in script, but incase you haven’t we are posting some photos here. 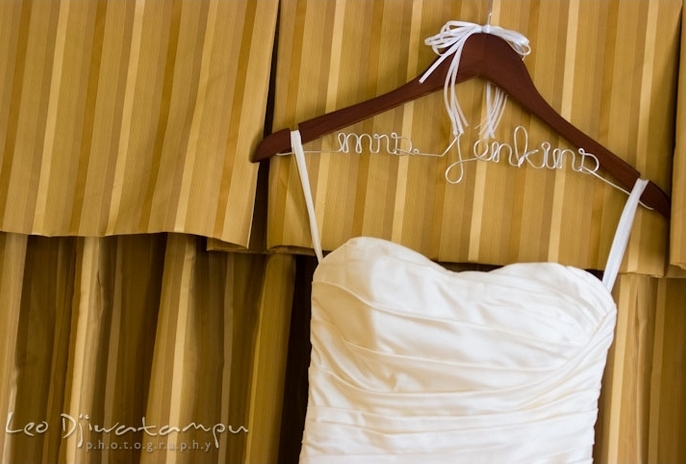 Why we love personalized wedding hangers, and you should too! 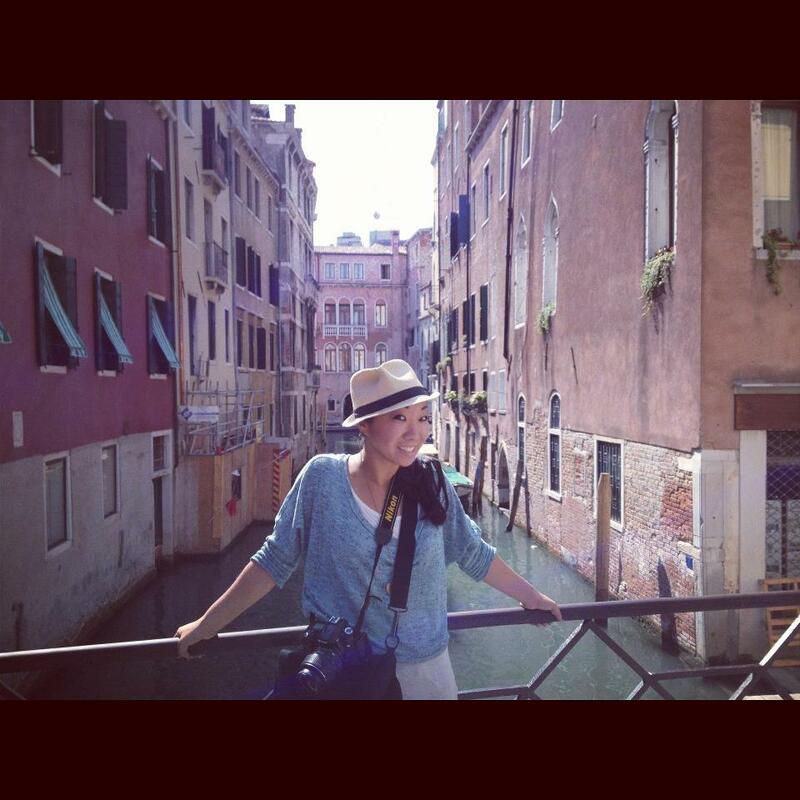 • They look amazing in photos! • They’re the perfect accent to your wedding dress – If you’re going to spend thousands on the dress, isn’t only proper to hang it on something equally special that will highlight just how exciting this experience will be? • Personalized wedding hangers make the BEST bridal shower gifts!! • Personalized wedding hangers are keepsakes that will last a lifetime. They defy the ages & will be the perfect shower gift for your daughter or son too! 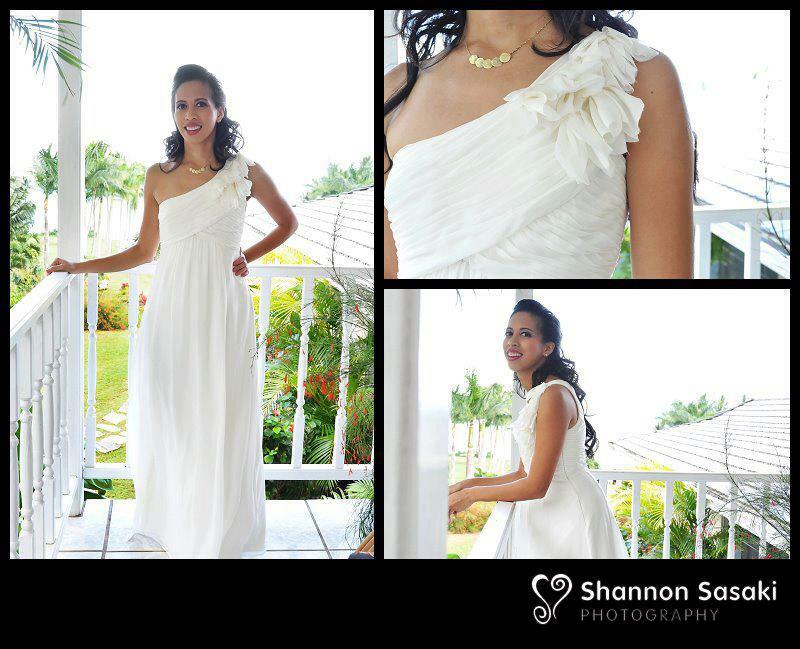 Photos compliments of Leo DJ, The Wedding Hanger Shop and Celebrity Bride Guide. 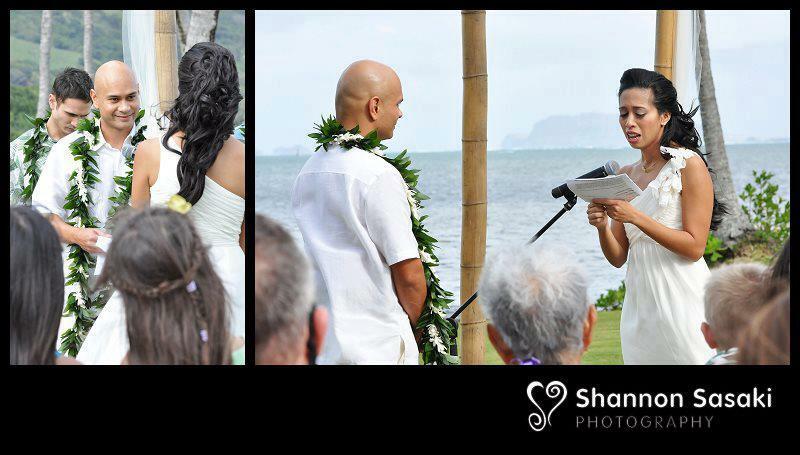 A extra special Mahalo to Travis of the Wedding Hanger Shop for the Free Personalized Wedding Hanger. Looking for the perfect gift for your fiancee, bridesmaids, mother, mother-in-law, maid of honor? Today I came across this amazing company called The Find that creates Personalized slippers! OMG – what a great gift for your fiancee right? Just put an engagement photo on there and slip them under his seat at the reception.. what an awesome surprise! OR get some made for your bridal party with you and your best friend, you and your sister, or you and your college roommates photos on them. Printed, personalized, super special flip flops – It’s the perfect bridal party gift! Completely personalized and sure to make a huge impact in letting them know how important they are to you. Here’s the best part, for a limited time, on one of my favorite websites for great Hawaii deals – The Find, is offering a 1/2 off deal – Just $19 for custom flip flops! Don’t miss out – these deals don’t last long. Here is the link to these personalized bridal party flip flops. I hope you LOVE this idea as much as I do !! This could also make a really cute bridal shower gift – add a Mrs. XXXXX on there and you’re good to go!! We had the privilege of working with a lovely couple ~ Mary Despe & Tony Perrault this past February. Feeling a little overwhelmed in the planning process, Mary started searching for a wedding planner & ended up finding us, Best Day Ever Hawaii on Craigslist. Mary and Tony had been dating for years and finally decided it was time to tie the knot. 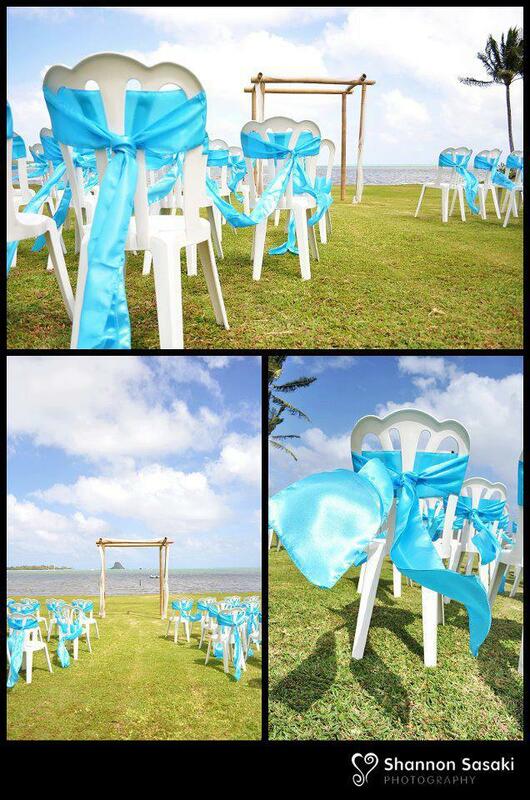 They envisioned a beautiful outdoor wedding. A close friend was lending them her home to use for the wedding venue, another friend had agreed to bake them a fabulous cake, and another friend was already on top of designing the invitations… but, thats about as far as they got. They were still struggling with the guest list, weren’t sure where to start with the catering and rentals and had no idea how to handle the timeline. 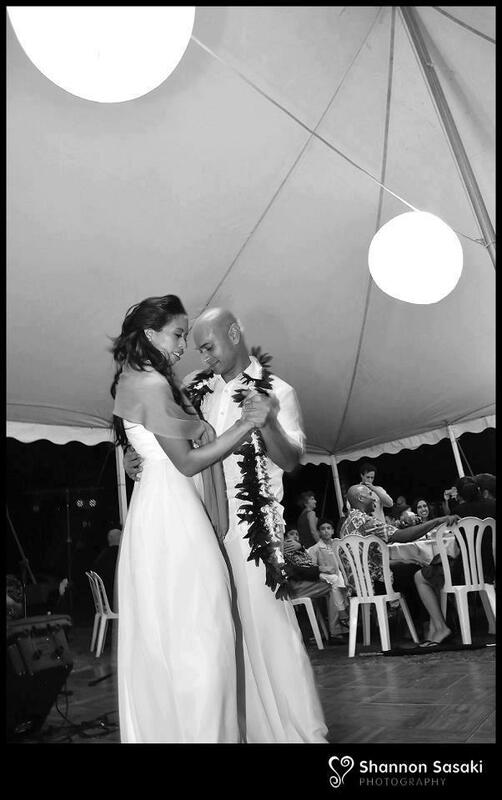 Luckily, that’s what exactly what a Hawaii Wedding Planner is for, and a good wedding planner handles all of those things and so much more. We helped Mary and Tony organize their guest list and RSVP’s into an organized spreadsheet, we got down to the basics and completely took over their budget so we could save them $$ right away and stay on course with a set budget, we helped them find the best caterer, rental company, valet company, deejay and florist for their budget and personal style, we assisted with their wedding rehearsal, helped create their timelines and we also provided them with a full wedding design package. Most importantly though – we made two new wonderful friends. 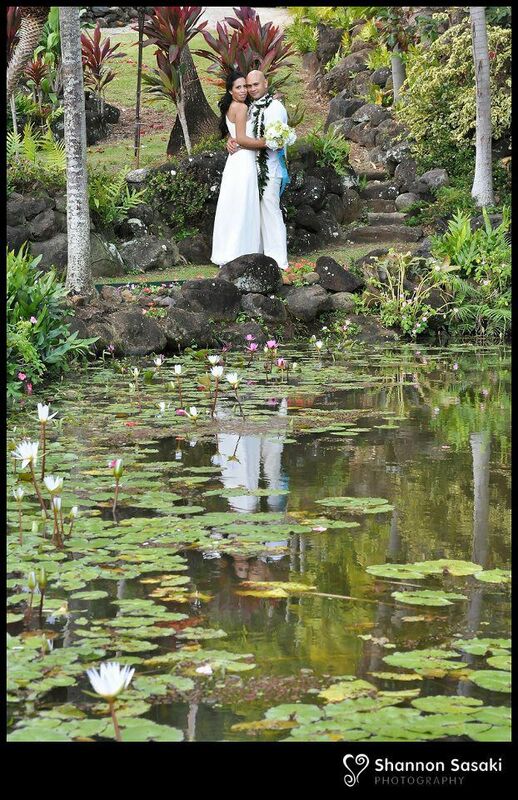 The wedding was held at a friends estate out on the east side of Oahu right in front of Chinamans Hat. Erika and I arrived at the site at 2am to start on the floral arrangements. Although we don’t usually do florals, we became very close with Mary and Tony and decided for this one wedding we’d make an exception and help them out by doing the florals to save them a little money. 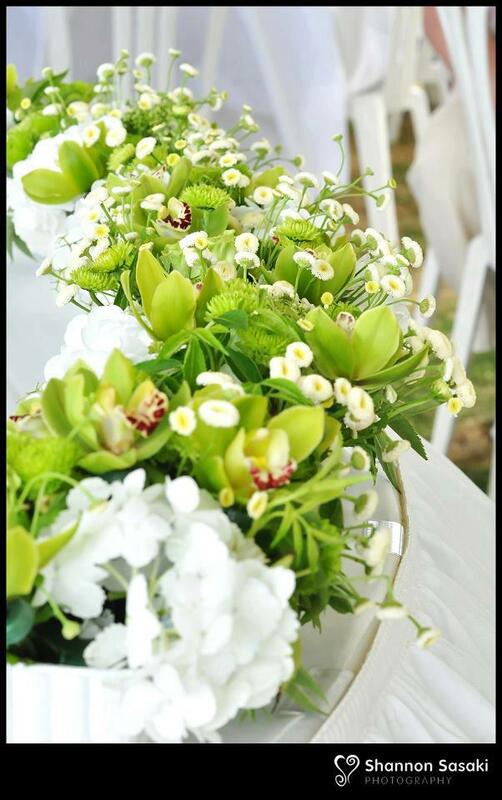 I think they turned out beautifully and I must say I was very impressed with the the lovely cymbidium, green african rose and hydrangia bouquet I made too, but oh boy was it a ton of work! 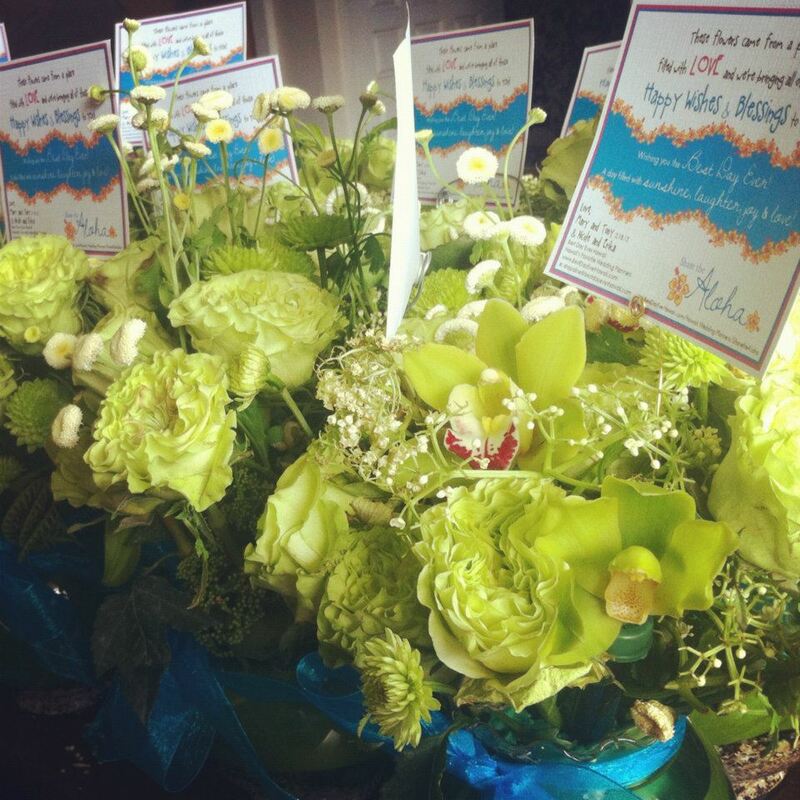 We give all of you florists so much credit! Those $60-$200 centerpieces are worth every penny. The rest of the vendors started trickling in around 11am and continued coming until the ceremony started at around four. There were a few little hiccups – the weather being a big one… just as we finally finished setting up the ceremony (chairs, isle, chair sashes) and all 25 of the guest tables (floral centerpieces, scattered shells around the sides, hula doll favors with personalized tags, table cloths, dishes, table runners, etc.) it started to pour buckets. We quickly gathered a team to help move all 25 of the tables a few feet over to keep everything dry. The strong winds that day were also a bit of a problem so straightening out the centerpieces and linens was a constant battle as was trying to keep the tiki torches lit with the winds… but everything did get set up (almost as perfectly as planned) and then, as if by magic, the sky suddenly cleared – just in time for the ceremony to begin. This ceremony, like the couple, was completely unique – they had a an entourage of flower girls and boys who preceded them. One child held each of their cute little doggies~ Pogi and Panda and then another two chased their pet chicken down the isle, unfortunately Pinky (the chicken), had other plans – and decided not to go down the isle but rather to run off to the side. I tried to re-direct Pinky, but had no success. This was quickly forgotten when the beautiful bride began her stroll down the long isle to her husband to be, escorted by both of her parents. The ceremony was followed by an amazing reception that included a really funny surprise slideshow which included photos of the groom in a speedo done by the groomsmen (I helped them coordinate setting up the secret slideshow ahead of time), a one of a kind emcee and host – Chief Sielu Avea, who’s understated humor had the entire crowd laughing throughout the night, and a complete tahitian dance show and fire dance performance. All of this was made complete with amazing food (Beaches & Backyard Catering) a delicious homemade wedding cake created by friend Jane Stites and an awesome DJ – Phillip Duong – who managed to get most of the guests up and dancing on the dance floor for the remainder of the night. Through the few months of planning, we got to know Mary & Tony very well… we saw them fight, laugh and cry together, we saw them exchange what could have been the most touching vows we have ever heard, we got to see first hand what it is like to be a florist, we got to chase their pet chicken down the isle (that was a first), we saw Tony almost burn himself doing a very gutsy and impressive fire dance, but the best part ~ we got to witness a wonderfully beautiful ♥love♥ story. And through it all, we grew to love them both dearly! 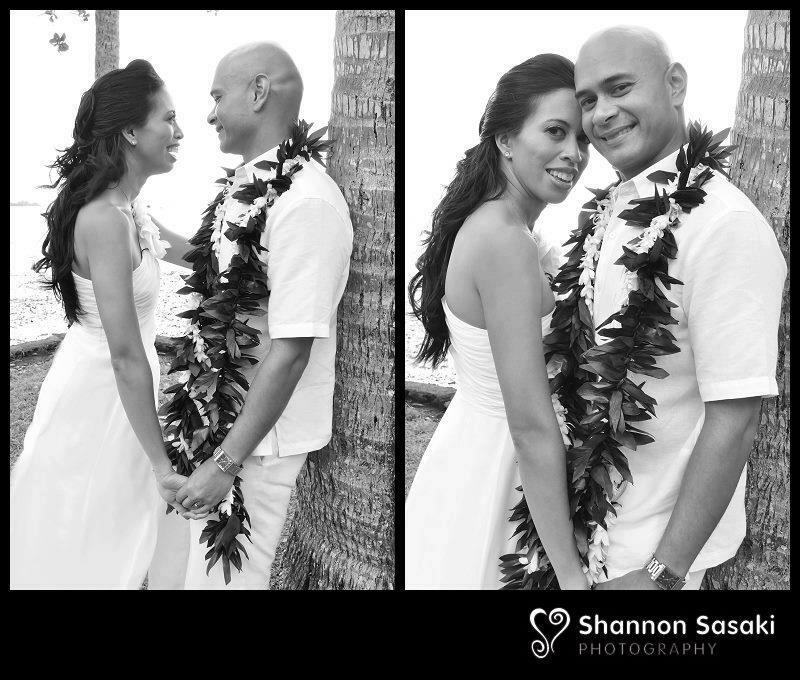 We are so excited to share with you their wedding photos courtesy of Shannon Sasaki of Shannon Sasaki Photography. 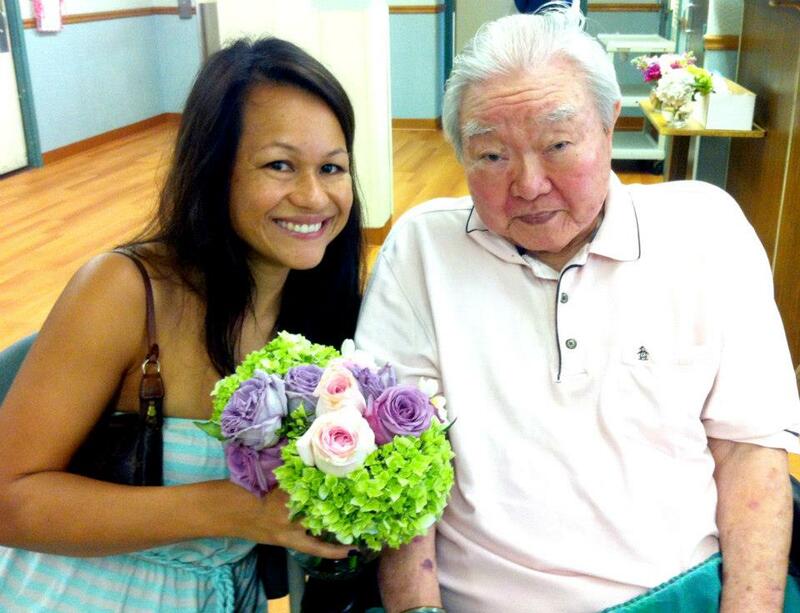 We would also like to thank Manoa Senior Care & Lisa Chung, Director of Volunteers of Kapiolani Medical Center for helping us to bring smiles to those who need it most! For more info. 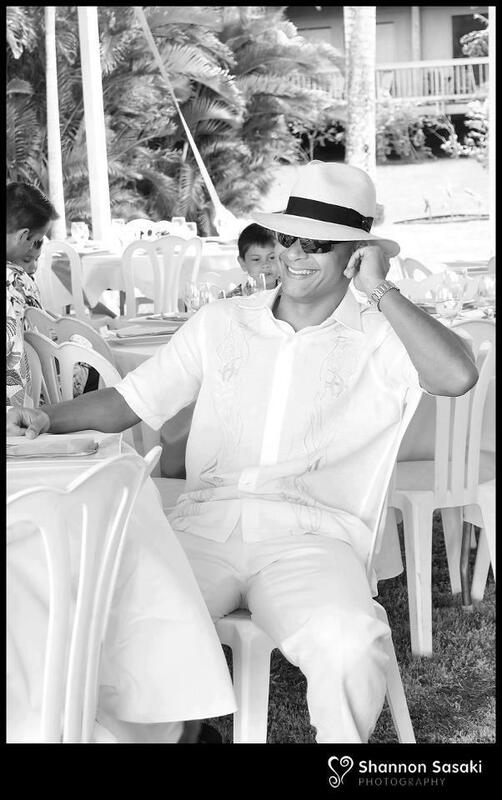 on Share the Aloha – please check our website – Share the Aloha.